The new KFC Double Down sandwich is a one-of-a-kind sandwich features two thick and juicy boneless white meat chicken filets (Original Recipe® or Grilled), two pieces of bacon, two melted slices of Monterey Jack and pepper jack cheese and Colonel's Sauce. This product is so meaty, there’s no room for a bun which is ridiculously heavy, tasty and awesome! 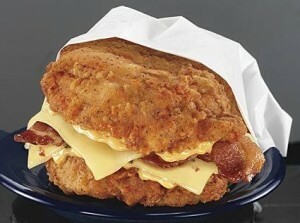 Try the KFC's Double Down Sandwich for yourself!